Germany’s Rhine River could be impassable to ships again this summer if Europe has another drought, a once-rare weather phenomenon that’s becoming more likely with an increase in the temperature. That’s the opinion of German and Swiss scientists who say that heavy snowfalls in the alpine regions at the river’s source are no guard against a repeat of low river levels, which blocked a key choke-point in October. Last year’s impasse was severe enough to dent German economic growth and underlines how even advanced economies are feeling the impact of global warming. 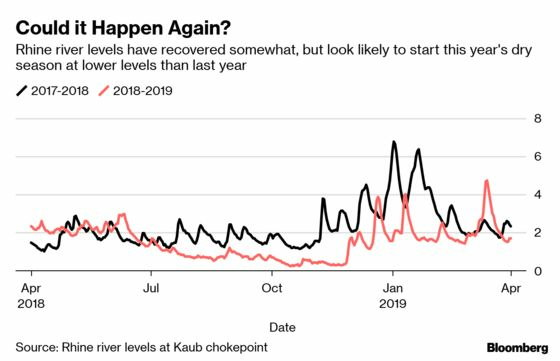 Winter rains allowed the Rhine to re-open in March for the most heavily-laden ships, but water levels in Kaub, one of the shallowest parts of the river, are 20 percent lower than at the start of last year’s dry season. In addition to that, water tables in northern Germany are still recovering from the 2018 heatwave, and the glaciers that help feed the river are shrinking. It all points to a repeat of last year’s conditions if there’s another drought. While scientists say the prolonged 2018 heatwave was exceptional, the chances of another drought are rising and can’t be excluded for this year. Companies hit by last year’s low river levels, including chemicals giant BASF SE and steelmaker Thyssenkrupp AG, are preparing for the worst. Low Rhine river levels are expected to happen more often as glaciers continue to shrink. A study published by ETH Zurich on Tuesday found almost all Alpine glaciers could be gone by 2100, leaving the Rhine all but entirely dependent on rain during dry summer months. The study predicts half of Alpine glaciers will be gone in around 30 years time. German authorities are starting to prepare for that risk. They plan to dredge the Rhine to increase flows, although engineering works could take as long as 10 years. The transport minister for Germany’s heavily industrialized state of North-Rhine Westphalia said last week that dredging must be made more speedy due to increased drought risk. 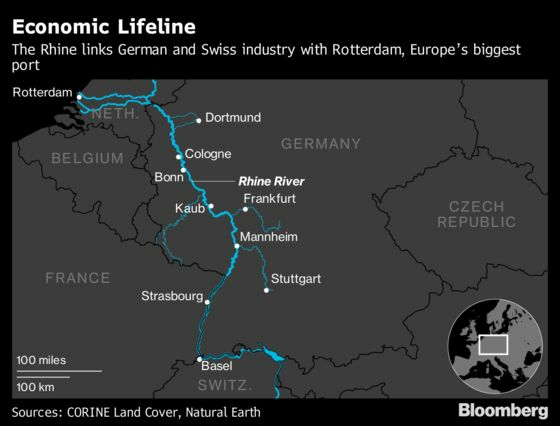 With its source high in the Swiss Alps, the Rhine snakes more than 800 miles (1,300 kilometers) through some of Europe’s most important industrial zones before emptying into the North Sea at Rotterdam. Shipping heavy goods such as steel or oil drums by barge remains vastly cheaper than road or rail alternatives. BASF, the world’s biggest chemical company, said the low waters cost it about 250 million euros ($281 million) after its main Ludwigshafen plant was cut off from export markets downriver and overseas. A mix of glacial run-off and rain feeds the Rhine. The contribution from glaciers has dwindled in recent years. The most recent in-depth study by the Swiss government found alpine ice flows shrank almost 30 percent between 1973 and 2010. The decline may be as much as 35 percent now. 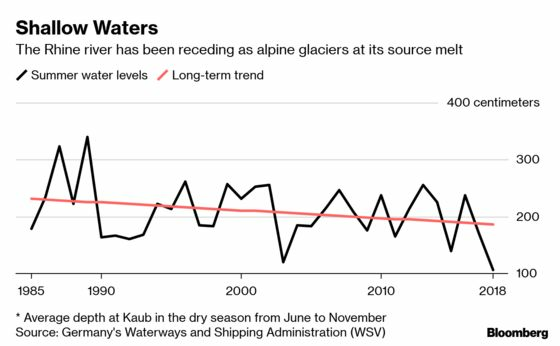 It would take “decades” of winters with above-average snowfalls to reverse the trend toward shrinking glaciers, according to Stephan Bader of Switzerland’s federal weather agency. That concerns German weather experts who say the chances of prolonged dry spells are increasing due to climate change. Warmer average global temperatures are disturbing the prevailing westerly winds that cause shifts in Europe’s weather, meaning dry or wet periods could last longer. Hydrologists are also concerned that water tables haven’t been fully filled after last year’s drought, meaning dry weather could quickly lead to low river levels as plants, trees and lakes soak up any rainfall.